Numerically analyzing the effect of identified risks on overall project objectives. Trong Qualitative PM xác định xác suất probability ở thang đo 7/10 với 1 risk nào đó, thì trong định lượng Quantitative sẽ phải tính xác suất này xảy ra với xác suất tính theo phần trăm (giả sử là 80%). Trong Qualitative PM xác định ảnh hưởng ở dạng thang đo 6/10 với 1 risk nào đó, thì trong định lượng Quantitative có thể tính ảnh hưởng lên tiến độ dự án trễ 2 tuần hay chi phí phải invest thêm là 10.000$ chẳng hạn. Though we have done the Qualitative Analysis in the previous chapter, we are not complete. We still need to do Quantitative Analysis. Quantitative risk analysis is generally performed on risks that have been prioritized by using the qualitative risk analysis. Determine what methods of quantitative risk analysis to use, how they will be used, and who will be involved (If not ready done in the Plan Risk management process). Determine the quantified probability and impact of each risk using one of the choices provided. Determine which risks warrant a response in Plan risk responses. Determine which activities included risks that warrant a response in Plan risk responses. Determine level of risk (Risk exposure – EMV) the project currently has. 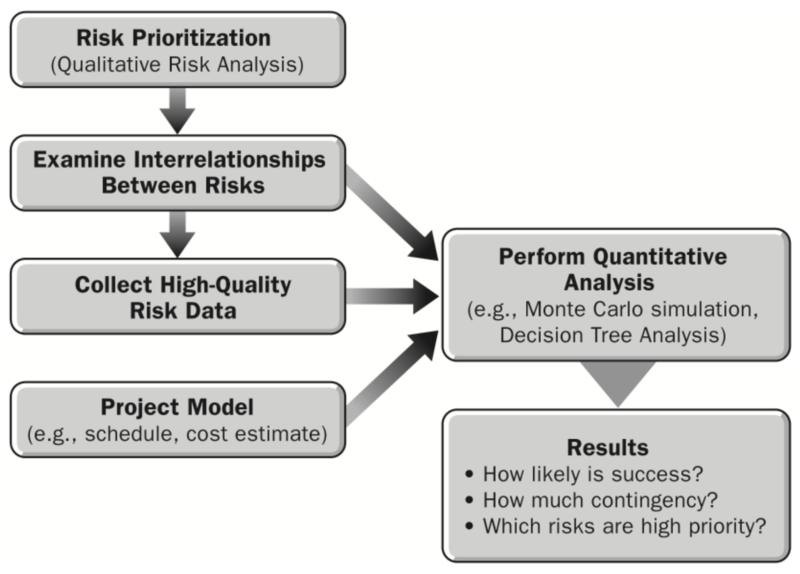 Determine how much project will cost and how long project will take if no further risk management actions are taken to decrease the project risks (Monte Carlo). 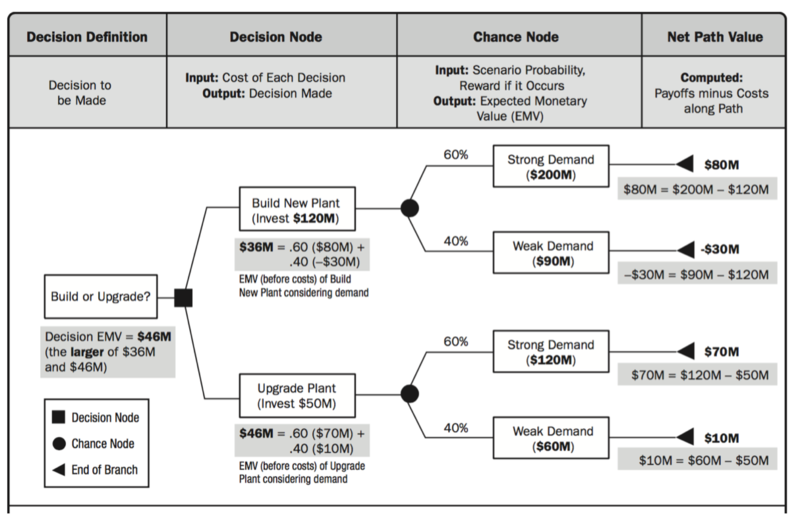 Determine probability of achieving the cost and schedule objectives for the project. To analyze the effect of risks on the project objectives, you need to know the project schedule and the project cost. These can be found in the cost management plan and schedule management plan. Also, the approaches taken by these plans can affect quantitative risk analysis. Interviewing – This technique is used to collect the data for assessing the probabilities of achieving specific project objectives. You are looking for results such as: We have a 70% probability of finishing the project within the schedule desired by the customer. Or: We have a 60% probability of finishing the project within the budget of $100,000. The goal is to determine the scale of probabilities for a given objective; for example, there is a 20% probability that the project will cost $50,000, a 60% probability that it will cost $100,000, and a 20% probability that it will cost $150,000. The data is collected by interviewing relevant stakeholders and subject matter experts. Most commonly, you will be exploring the optimistic (best case), pessimistic (worst case), and most likely scenarios for a given objective. Probability distributions – After you have collected the data on meeting the project objectives, you can present it in a probability distribution for each objective under study. Note that a distribution represents uncertainty, and uncertainty represents risk. For example, if you know for sure the project will cost $25000, there will be no distribution because it is only one data point. Distribution comes into the picture when you have several possible values with a probability assigned to each value. There are distributions of different shapes in which the data can be presented. Look at the picture above. This example is for the cost objective. The X axis represents the cost, and the Y axis represents the corresponding probability that the project will be completed within that cost. 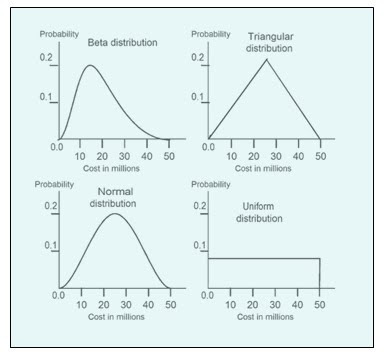 The beta distribution and the triangular distribution are the most frequently used distributions. The other commonly used distributions that could be suitable under given circumstances are normal distribution and uniform distribution. The uniform distribution is used when all the values of an objective have the same chance of being true. Sensitivity analysis – This is a technique used to determine which risk has the greatest impact on the project. You study the impact of one uncertain element on a project objective by keeping all other uncertain elements fixed at their baseline values. You can repeat this analysis for several objectives, one at a time. You can also repeat this study for several uncertain elements (creating risks), one element at a time. This way, you can see the impact of each element (or risk) on the overall project separate from other elements (or risks). Therefore, the EMV in this case is Rs. 400. The concept of EMV can be presented in a decision-making technique, such as a decision tree analysis. Decision tree analysis – This technique uses the decision tree diagram to choose from different available options; each option is represented by a branch of the tree. This technique is used when there are multiple possible outcomes with different threats or opportunities with certain probabilities assigned to them. EMV analysis is done along each branch, which helps to make a decision about which option to choose. Look at the image below. It is a simple decision tree. Modeling and simulation – A model is a set of rules to describe how something works; it takes input and makes predictions as output. The rules might include formulas and functions based on facts, assumptions, or both. A simulation is any analytical method used to imitate a real-life system. Simulations in risk analysis are created using the Monte Carlo technique, which is named after the city of Monte Carlo; known for its casinos that present games of chance based on random behavior. Monte Carlo simulation models take random input iteratively to generate output for certain quantities as predictions. This technique is used in several disciplines, such as physics and biology, in addition to project management. In risk analysis, the input is taken randomly from a probability distribution, and the output for impact on the project objectives is predicted. The name “Monte Carlo” refers to the random behavior of the input. Expert judgment – In quantitative risk analysis, expert judgment can be used to validate the collected risk data and the analysis used for the project at hand. Probabilistic analysis of the project – This includes the estimates of the project schedule and cost with a confidence level attached to each estimate. Confidence level is expressed in percentage form, such as 95%, and it represents how certain you are about the estimate. You can compare these estimates to the stakeholders’ risk tolerances to see whether the project is within the acceptable limits. Probability of achieving the project objectives – Factoring in project risks, you can estimate the probability of meeting project objectives, such as cost and schedule, set forth by the current project plan. For example, the likelihood of completing the project within the current budget plan of $100,000 is 70%. Prioritized list of risks – Risks are prioritized according to the threats they pose or the opportunities they offer. Risks with greater threats (or opportunities) are higher on the list. The goal is to prioritize the response plan efforts to eliminate (or minimize) the impact of the threats and capitalize on the opportunities. The priorities are determined based on the total effect of each risk to the overall project objectives. Trends in the results – By repeating the analysis several times and examining the results, you might recognize a trend for specific risks. That trend might suggest further analysis or a specific risk response. In finding the trend, you can also take a look at the historical information on project cost, quality, schedule, and performance. Cam on kien thuc PMP.